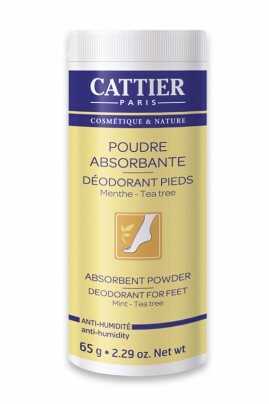 Cattier Natural Feet Deodorant Powder absorbs excess perspiration, neutralises bad odours, softens and cleanses the epidermis thanks to Organic Mint and Tea Tree (Australian tea tree) essential oils, leaving a pleasant, invigorating fragrance. Lightly scented, your feet stay soft, dry and fresh all day long. Sprinkle Cattier Natural Feet Deodorant Powder all over the feet, concentrating on the soles and between the toes, or apply directly inside the shoes. Talc, Hydrated Silica, Mentha Piperita Oil*, Melaleuca Alternifolia Leaf Oil*, Limonene, Linalool.